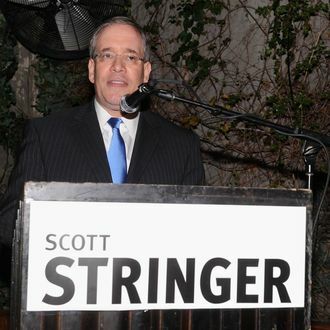 Manhattan Borough president Scott Stringer faced stiff competition among Democrats running for mayor next year, and was pulling in only 6–7 percent of City Democrats’ support in early polls, Crains reports. But now that he’s decided to run for comptroller against Councilman Dan Garodnick instead, he’s suddenly a much more competitive candidate, with a host of high-profile endorsements (including Ed Koch, Gloria Steinem, and current Comptroller John Liu) and $4 million already raised, which is eligible for matching. The maneuvering wasn’t lost on Garodnick spokesman Dan Levitan, who told Crains, “Dan didn’t choose to run for comptroller because he thought it would be the easiest race,” but because it’s the job “best suited his talents and experience.” Now Stringer gets to play power broker a little bit, being coy about whom he’ll endorse for mayor as the rest of the field vies for his supporters.